1 Year Warranty Included. Ships LTL Freight curbside. Phone # required before we can ship. 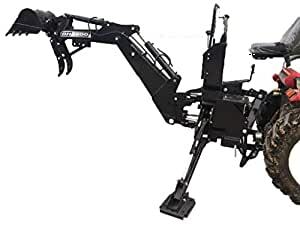 BH5600 PTO 3 Point Backhoe Tractor Excavator Attachment w/ Pump 15″ Bucket Features / Specifications: Maximum Digging Depth – 6′ Feet Digging Depth (2 Foot Flat Bottom) 66″ Inches Swing Arc – 180 Category 1 3-Point Linkage Loading Height (Bucket at 60) – 50″ Inches Reach from Center Line of Swing Pivot – 90″ Inches Transport Height (Maximum) – 49″ Inches Recommended for Tractors 18-25HP Bucket Rotation – 180 Degrees Loading Reach (Bucket at 60) – 34″ Inches Transport Overhang – 40″ Inches Undercut – 26″ Inches Stabilizer Spread (Down Position) – 67″ Inches Stabilizer Spread (Up Position) – 42″ Inches Bucket Cylinder Digging Force – 2046lbs Dipperstick Cylinder Digging Force – 1047lbs Hydraulic Volume Requirements – 3 to 4 GPM Hydraulic Pressure Requirements – 2000 psi Weight: 554lbs (before bucket) ~750lbs crated w/ bucket, thumb, and tank included Color – Black 1 Year Warranty Included IN STOCK AND SHIPS FAST! Free Shipping within mainland USA Ships LTL Freight curbside. Phone # required before we can ship.